Jumping Jokers is a jolly good Novomatic slot game for novices. It’s a straightforward slot game which is easy to follow. The design is super colourful and joyful! The main character is a jester from a jack-in-the-box toy. Jesters certainly are jokers, and they have been around for centuries! Traditionally, royal Kings and Queens employed jesters to make jokes and jests and entertain themselves and the lords and ladies of their royal court. This slot game is very aptly names because the jokers do jump indeed! This is a special feature that makes this slot game more exciting to play than any old simple slot. Most of those just have plain symbols and no extra features that make it stand out. Jumping Jokers also has a Scatter symbol which gives Scatter wins. Jumping Jokers isn’t a slot game that hands out Free Spins unfortunately. However, the payout percentage is high so that makes up for it. The noises, special sounds and the background music are all very typical of Novomatic. So, anyone who’s played a Novomatic slot before will immediately recognise the sound effects. 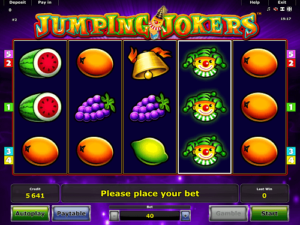 Other typical Novomatic casino features, that Jumping Jokers has, are: gamble and autoplay. These are both self-explanatory. The autoplay feature from Novomatic isn’t as sophisticated as it is from other developers. It just spins the reels for you until you switch the feature off. The Jumping Joker is the main character in this game and the best symbol you can get on the reels! He is the Wild symbol of the game and he can step in for any of his friends. With his substitution abilities, he can complete a win for any symbol that isn’t the Scatter symbol. These ordinary symbols are: cherries, lemon, orange, plum, grapes, watermelon, bell and star. A payline will award a win for 3-of-a-kind, 4-of-a-kind and 5-of-a-kind. Paylines pay from the left to the right, which is how the matching symbols must land, consecutively. Only the Wild symbol can fill a gap! The payline rules don’t apply to the Scatter symbol. It’s a rebel! The rebel Scatter symbol is a golden crown, encrusted with gems. The Jumping Jokers Scatter gives a guaranteed payout for 3, 4 and 5 matches anywhere on the reels. The best part about the Scatter wins is that they will always be a mystery! 3 Scatters award a mystery win up to 100x your bet. 4 Scatters pay a mystery win of up to 500x your bet. 5 Scatter symbols can award a maximum win that’s equal to 1000x your bet per spin! Another cool feature about this slot, and how it got its name, is the jumping Wild jester symbol. If you spin and stop the reel, and a Wild symbol is present on any position of any reel, it will jump! The Wild symbol, when it lands, will duplicate and jump to cover the entire reel it landed on. This might not help you get more wins but sometimes it will help you loads and give you some big wins! Fruit symbols, card values and jolly jesters are the most often used symbols in Novomatic games. Time and time again, these traditional symbols fill the reels of Novomatic slot and video slots. It’s not just their old games that have these sorts of symbols, even new Novomatic slots have fruits and jesters! Sometimes the jester is called a joker, and sometimes it’s called a jolly! It all depends on the game. What is for certain, though, is that the jolly, joking jester symbols are always happy! If you’re looking to see this character more, you should try out these other Novomatic slots: Blazing Riches, Fruits n Royals, Grand Jester, Sizzling 6, Mega Joker and Jester’s Crown.